Many medical professionals have referred to stress as the “silent killer”. Stress can lead to many physical, emotional, and interpersonal issues if left unchecked. From headaches to anxiety to damaging personal relationships, stress can be far reaching and deeply detrimental in our lives. But did you know that stress has also been linked to hearing loss? Stress is your body’s natural way of dealing with difficult situations. By releasing chemicals into your bloodstream, your body is given a boost in energy or strength. In archaic times, this was crucial for survival when we had to either run for our lives, or hunt for food. In modern times, however, the release of these chemicals may not be as beneficial as to us as it was our ancestors. Stress becomes damaging when we face stress every day or even every hour. It can wear us down, exhausting our bodies. Constantly worrying everyday things like our jobs, our families, or our finances can lead to chronic stress. The National Institute of Mental Health (NIMH) states that constant, long-term stress can be harmful to our health as our bodies do not receive a clear signal to return to normal like it does when the stress is acute. This may lead to serious health problems such as heart disease, high blood pressure, and even hearing loss. As chronic stress plays a large part in the negatively impacting our body, it also can cause both hearing loss and tinnitus. How exactly? It’s all about circulation. Chronic stress plays a large role in the slowing of blood flow, which is directly linked to the tiny little hairs that require flow of blood and delivery of nutrients for its survival. The overproduction of adrenaline occurring in chronic stress can reduce or even halt blood circulation to the inner ear causing hearing loss over time or even a sudden loss of hearing. 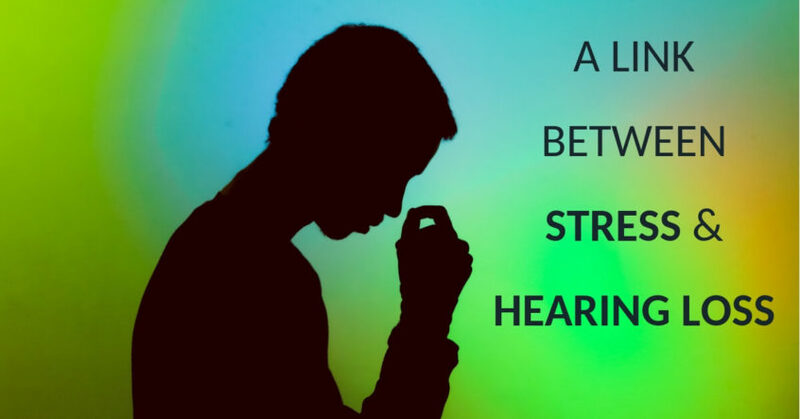 Although these symptoms seem quite obvious and easy to recognize, the fact that you are experiencing the chronic stress may take your attention away from identifying hearing loss immediately. When you experience sudden hearing as a reaction to chronic stress, it is often reversible as you reduce the stress level, returning blood flow to the ears, and rehabilitating the hair cells within the inner ear. Meditate: Meditation is a great stress reliever. It helps reduce compounded negative thoughts and increase a sense of mindfulness and a peaceful natural state. Take Breaks During Work: A great way to reduce stress if you are overworked is to take regular breaks! Certain tasks that seem overly difficult may appear much easier to accomplish after a short interlude. This helps relieve the stress that could build up. Be Positive, Smile, and Laugh: Visit websites that may help keeping a positive mindset when dealing with stress. Smiling and laughing sends happy signals to our brain. Exercise Regularly: Exercise has been found to be one of the best methods to relieve stress. Walking for even half an hour a day can improve your mood and lower stress. Communicate & Socialize: Communicating or socializing with friends or family is not only a stress reliever, but also a great way at sustaining and bettering those relationships. Stress or no stress, if you are experiencing hearing loss for whatever reason, it is important to make an appointment to see a hearing healthcare professional. At Hearing Aid Associates, we can work directly with you to understand your personal hearing health history and also administer a hearing evaluation or test. Together, we will provide a customized treatment based on your hearing expectations!